A lush upgrade to the creatures and monsters of Skyrim. From vivid and bright to realistic and deep, there\'s a texture pack here for everyone. For all the fact that I created this mod, it wasn't as difficult as it looks. It DID take me HOURS though, so if you plan on using the re-textured files that I spent so long improving, it would be nice to see some credit. Balanced saturation, contrast and vibrancy. Created multiple files with varying levels of saturation, contrast and vibrancy. Removed all increases in brightness; contrast handles brightness now. Removed original texture pack from list of available downloads. Created "Sparkles - Lush Plant Texture Pack"
(Will be adding these updates to a new section in my mods called "Changelog". Keep an eye out) Update! We're now partnered with the talented Tytanis, creator of some truly phenominal pre-Creation Kit stuff! Tytanis is most widely known for his great work on the Tytanis - The Ultimate Mod - Crafts - Spells - Items - MORE[url] mod. When I first opened a texture from Skyrim's texture folder, I thought I might faint. There's really no other way to put this: It was extremely dull. 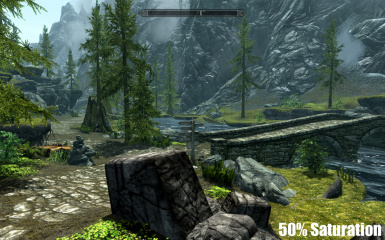 This mod is a rather simple in theory, as it works by simply bringing out the would-be colors in the Skyrim textures. It makes sure that the greens are green, not brown. Suddenly strawberries are bright and noticeable rather than dirt red. In short, this texture pack will improve the visual quality of your ground/plant/tree life by a stark, noticeable measure. 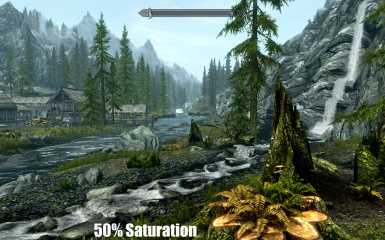 The world of Skyrim will come alive before you. This make-over is a work in progress, and I will soon be working on more textures for both the natural environment and structural things. If you have suggestions, comments or requests, be sure to drop me a line. Which file is for me? This file set makes your textures "Pop", but it will leave the original colors (it only slightly increases them). Use this is you want your world to have more depth without extra color. Increases the colorfulness of your world by a small margin, making it lush and beautiful. Use this is you don't want to take away from the realism, but still want more color. This set of textures increases the color and contrast both slightly, making a perfect mix for something between lush and gaudy. If you want things to be colorful and pop a little as well, this one is for you. Like COLOR? No I mean, do you like GAUDY COLOR? Use this pack. 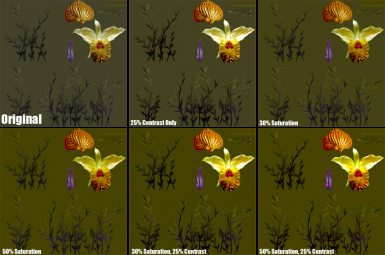 It'll increase the color of your plants/trees by 50%, making everything very, VERY COLORFUL. I hope you don't mind losing your eyesight just a little, because if anything can do that it'll be this file set. If you want ultra gaudiness, this one is for you. If you're a colorholic who can't get enough epilepsy, this is for you. Alright, listen up everyone. This texture pack was designed with love, cookies and enjoyability in mind. Just thought you'd like to know that. 2. Grab a milkshake, slay some dragons and enjoy. 3. If you like it, endorse it. Together we can improve it! 1. 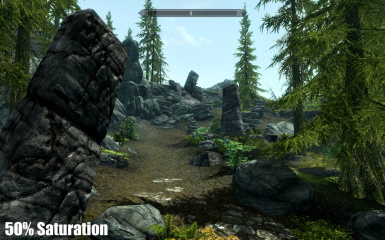 Navigate to your Skyrim Data directory, where you installed this pack to. Open "textures". 2. You can either rename the folders "landscape" and "plants" to something else like "landscapeOLD", or you can delete them. Either way, it will uninstall this precious, precious mod. This pack should be compatible with all mods except other texture mods. Of course, if you know what you're doing, you can mix and match right? There's not much to say on this subject, so I'll just give you something to chew on. 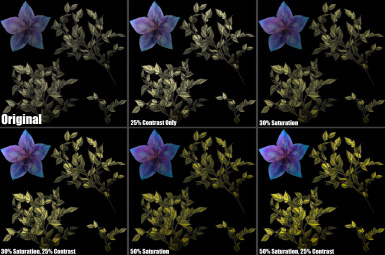 Injectors change the actual settings of the game, making it more lush... but at a cost. It can severely impact your system's performance, and is basically the same as turning your graphics up to high (Or more, depending on your settings). Texture packs do not change any settings in the game, but rather they take advantage of Skyrim's texture system. By default, Skyrim will use a packed .BSA file to retrieve it's textures. However, if you create a folder called "textures" in the Data folder, it will take what textures it finds there and use them instead. The nice thing about this is that Skyrim, like Oblivion, is programmed to use textures it cannot find in your "texture" folder, by accessing the .BSA. So you can basically add 1 new texture if you wanted, and as long as it was correctly named, Skyrim would only change that texture in-game. I'm not saying injectors are bad, but they're probably not the best for most people. Is your mod compatible with injectors? Yes. My mod effects the texture files, injectors effect game settings. You could say that the two go hand-in-hand. Some of the distant trees are grey, but they're rather close. Can I increase the render distance so they're colored properly? Yes, but it involves you adding a new string to your Skyrim.ini. In the [General] section of the ini, add "uGridsToLoad=7" without quotations. Skyrim is made up of "grids", and it loads these in a certain distance around you. This increases the amount of spaces it loads. There is a drawback though. Read on. Using this method, once you increase the grids from default to 7, you have to be careful saving games. If you save a game with 7, and then decide you want to have the default 5 grids again, you'll have to go through a process to "fix" your save. Otherwise, it won't load. To revert back to 5, you have to either save indoors and then change the 7 to a 5 (works for some people, OR the following method. Go into the game and load your save with 7 grids. ALT-Tab out of the game, go to your ini, chance the 7 to 5 and save it. To get back into Skyrim, click it in the taskbar, ALT-Tab to anything else, and then click on the screen. Now in the console in Skryim (press the ` key, to the left of the 1 key on most keyboards) and type "refini" without quotations. Now save over your game, and restart Skyrim. Use usGridsToLoad carefull, as it can severely lag up low-end computers and may cause occasional crashes. It WILL make your world a lot more beautiful though.